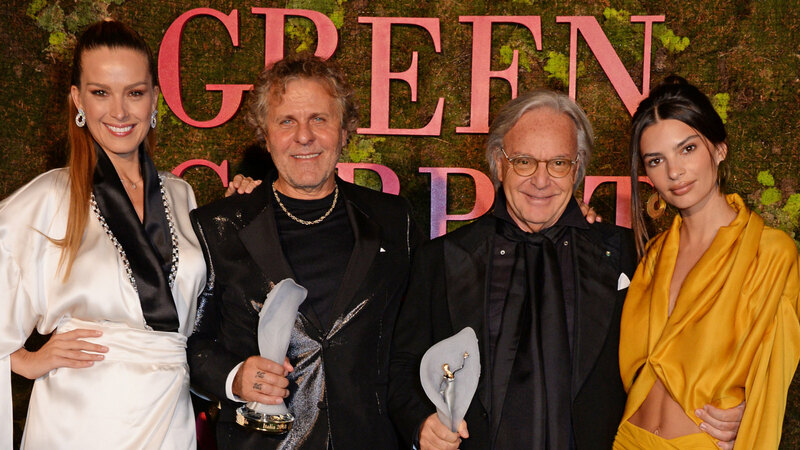 This year’s Green Carpet Fashion Awards, Italia, held at La Scala at Milano on Sunday, saw Suzy Menkes, Elle Macpherson and Donatella Versace pick up awards, along with four Australian farmers, who were awarded the Eco Stewardship Award. The event was opened by Carlo Capasa, president of the Camera Nazionale della Moda Italiana, who was joined by Livia Firth, the founder of the awards, whose husband, Colin Firth, also attended. ‘These awards are referred to as the awards that put the heart back into the global fashion industry. We will hear stories about transformative change and real solutions for a future where fashion is finally sustainable,’ said Livia Firth. Valentino creative director Pierpaolo Piccioli presented the Visionary Award to Menkes, Colin Firth presented the Handprint Award to Calabria Story, and Julianne Moore presented the Art of Craftsmanship Award to the cobblers of Salvatore Ferragamo, who were joined by chairman Ferruccio Ferragamo. The award for Technology and Innovation went to Frumat leather, presented by Hari Nef; Elle Macpherson won the Wellness Award for WelleCo, presented by Alison Brie and Nerio Alessandri; and Halima presented the Supply Chain Innovation Award to Sourcemap. Actress Cate Blanchett presented the Eco Stewardship Award to Bangor Farm’s Matt and Vanessa Dunbabin, and Connewarran Farm’s Richard and Jenny Weatherly. They travelled from Tasmania to accept the award, recognizing their work in trying to regenerate and increase biocapacity and resilience. Petra Němcová and Emily Ratajkowski presented the CNMI Award for Community and Social Justice to Diesel’s Renzo Rosso and Tod’s Diego della Valle. Jeremy Irvine, Arnie Hammer, Desirée Bollier and Vogue Italia’s Sara Sozzani Maino presented the Franca Sozzani GCC Award for Best Emerging Designer to Gilberto Calzolari. Hu Bing and Stefania Rocca presented the Sustainable Producer Award to Bonotto; Gucci CEO Marco Bizzarri presented the GCFA Leaders’ Award to Sinéad Burke; and supermodel Cindy Crawford presented the CNMI Award in Recognition of Sustainability bestowed to Donatella Versace, amongst rumours that she was about to sell the family business. Angela Missoni presented the Changemaker Award to Cameron Russell. Guests at the event included Alessandra Ambrosio, Alison Brie, and Olivia Palermo, among others. The post-show supper was held at Milano’s town hall, hosted by mayor Giuseppe Sala.